With June almost here, it is now time to start thinking about Men’s summer footwear. There are a number of different trends for 2012 summer footwear, some being new and some carrying over from years past. Casual wear is the trend for this summer, although there is one dress shoe trend. 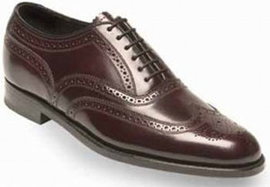 For summer 2012 the dress shoe of choice will be a wing-tipped dress shoe. This versatile shoe allows you to wear them with a full suit or with a pair jeans rolled up at the bottom for a casual look. The Florsheim Lexington Wing-Tip dress shoes are an excellent option if you want to wear them to work and then out afterwards for the night without having to change shoes. 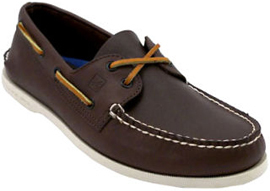 Boat shoes are great casual shoes for summer time fun. This style was seen last year, but you will see many more guys wearing boat shoes this summer. They are ultra comfortable slip-on shoes great for wearing to the lake when you go boating with friends, hence the name boat shoes. You can also wear them with a polo shirt and khaki shorts if you are attending a dressier occasion. Sperry offers a great selection of boat shoes in different styles and colors to fit all your summertime needs. A style that never seems to die is the classic Converse All-Stars Chuck Taylor Hi-Top shoes. 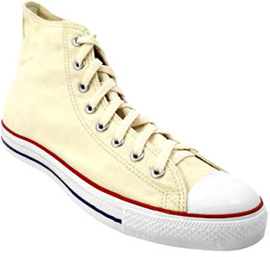 For 2012, the trend will be white Chuck Taylor's. White goes with anything so you will only need one pair of shoes! You can even wear them when you have to dress up to show your own individual style in any situation. Canvas shoes are a trend from last summer that will carry over into this summer (click here for our blog post from last summer on canvas shoes.) Canvas shoes are great casual shoes that you can slip on without socks and get where you need to be. 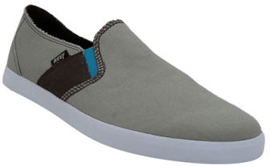 Reef's canvas shoes have their own look and style that most seem to like. Whether you run or just like the comfort of running shoes for everyday wear, the trend this summer will be running shoes with bright colors. You will see the bright colors trend in many different styles of shoes, but none as prevalent as in running shoes. Running shoes won’t lose any functionality, they will just brighten up your feet! 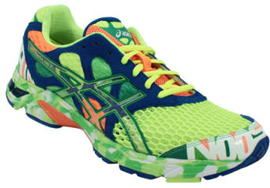 The Asics Noosa Tri 7 running shoes are a great example of the brightly colored running shoes trend. You can find these shoes, by clicking on links above, and many like them online at RogansShoes.com. You can also get fitted by one of our shoe experts at a Rogan’s Shoes location near you.